Mexico City's traffic is notorious given that some nine million people live in the core city. There were only 22 drivers on the race track during Saturday morning's Free Practice 3 for the Mexican Grand Prix, but they still managed to get in each other's way and mess up their lap times. 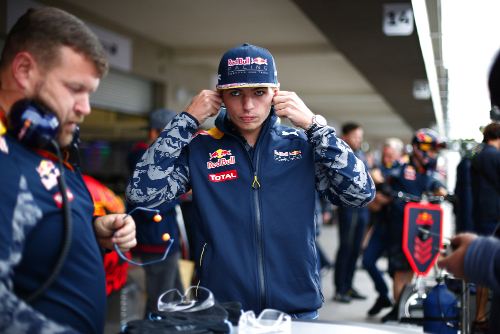 Max Verstappen avoided the traffic in his Red Bull to clock the fastest time of the session just ahead of Mercedes driver Lewis Hamilton. The line-up for the weekend was: Mercedes “ Lewis Hamilton and Nico Rosberg. Ferrari “ Sebastian Vettel and Kimi Raikkonen. Williams Mercedes “ Felipe Massa and Valtteri Bottas. Red Bull TAG Heuer “ Daniel Ricciardo and Max Verstappen. Force India Mercedes “ Nico Hulkenberg and Sergio Perez. Renault “ Kevin Magnussen and Jolyon Palmer. Toro Rosso Ferrari “ Daniil Kvyat and Carlos Sainz. Sauber Ferrari “ Marcus Ericsson and Felipe Nasr. McLaren Honda “ Fernando Alonso and Jenson Button. Manor Mercedes “ Pascal Wehrlein and Esteban Ocon. Haas Ferrari “ Romain Grosjean and Esteban Gutierrez. Vettel turned the fastest time on Friday “ a 1:19.790 that was a mere 0.004 of a second quicker than Hamilton. "Overall, we had a very good day, not judging the result but just judging the feeling of overall pace, and not just for one lap but all the laps we did," Vettel said Friday. "And we didn't have any problems and we were ahead of schedule leaving the garage, which is a very good sign." The Haas drivers were the first on track in FP3. They both did an intall lap and pitted. Pirelli had its super soft, soft and medium compound tires on hand. Friday's lap times were not dependant on the tire compounds, however, but rather because the track got quicker as the cars cleaned off the racing line. Most of the drivers were not that keen to head out in FP3 as the track was still quite green. "Not so much running at the start of the session. Softs the most popular option. We can expect some qualifying simulations later," Pirelli tweeted. Rosberg began a flying lap nine minutes into the session on the soft slicks. He stopped the watches at 1:24.046, and then did a 1:20.566. Now Hamilton was on the go, and he clocked a 1:20.158 on the soft compound Pirellis. Only eight drivers had set times one quarter of the way into FP3. The Ferrari and Red Bull drivers had not even done an installation lap. Hamilton's next run yielded a 1:19.721. Raikkonen finally did a flying lap 22 minutes into the session and clocked a 1:20.940 on the soft tires. That put him sixth behind Hamilton, Rosberg, Sainz, Massa and Perez. Vettel was next up, and he moved into second place with a lap in 1:20.048 using the soft compound Pirellis. Now, as the midpoint of the session approached, the track became very busy with all but a handful of drivers in action. Ricciardo grabbed fourth place, which became fifth when Verstappen took second place with a 1:19.959. Then Ricciardo moved into second with a 1:19.950, which was just 0.009 of a second quicker than Verstappen. Both Red Bull drivers were on the soft tires. Just past the midpoint of FP3 the order was now: Hamilton, Ricciardo, Verstappen, Vettel, Rosberg and Sainz. But the drivers had yet to do their qualifying simulations. Fastest through the speed trap at this stage was Bottas at 226.3 mph (364.2 kmh). Most of the drivers were in the pits with less than 15 minutes to go and preparing for their qualifying practice runs on the super soft tires. The top dozen were: Hamilton, Ricciardo, Verstappen, Vettel, Rosberg, Bottas, Sainz, Hulkenberg, Massa, Perez, Raikkonen and Kvyat. "We'll probably see a flurry of late action in #FP3: track temperatures gradually rising so becoming more representative," Pirelli tweeted. The track temperature was now 90 degrees Fahrenheit (32 degrees Centigrade). The action began with 10 minutes to go. Massa moved up to fourth place. Verstappen went to the front with a 1:19.137, and Ricciardo's 1:19.444 put him second. Ricciardo, Vettel, Rosberg and others encountered traffic on their fast laps. Hamilton improved to a 1:19.231 to take over second place, and Rosberg got up to fourth. FP3's traffic jam ended with the top 10 order being: Verstappen, Hamilton, Ricciardo, Rosberg, Bottas, Vettel, Raikkonen, Massa, Hulkenberg and Sainz.